What is the Email History? 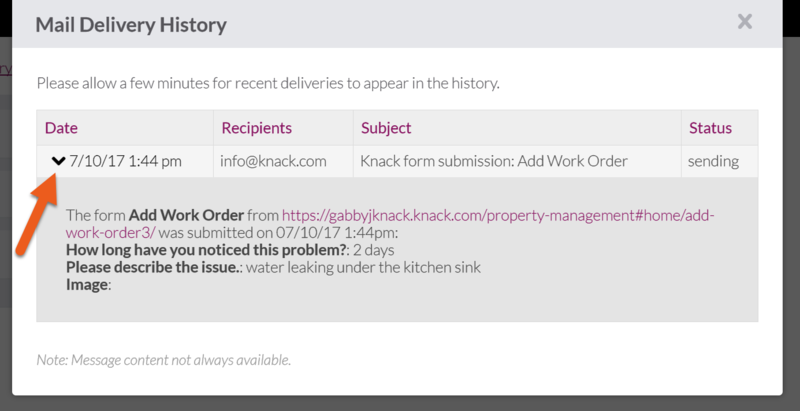 Knack keeps track of every email sent through your form views and scheduled tasks. This is useful for confirming that your recipients have received the email, troubleshooting any potential SPAM detections, and more. See our guide on emails to learn how to use email rules in your app: Send Emails. 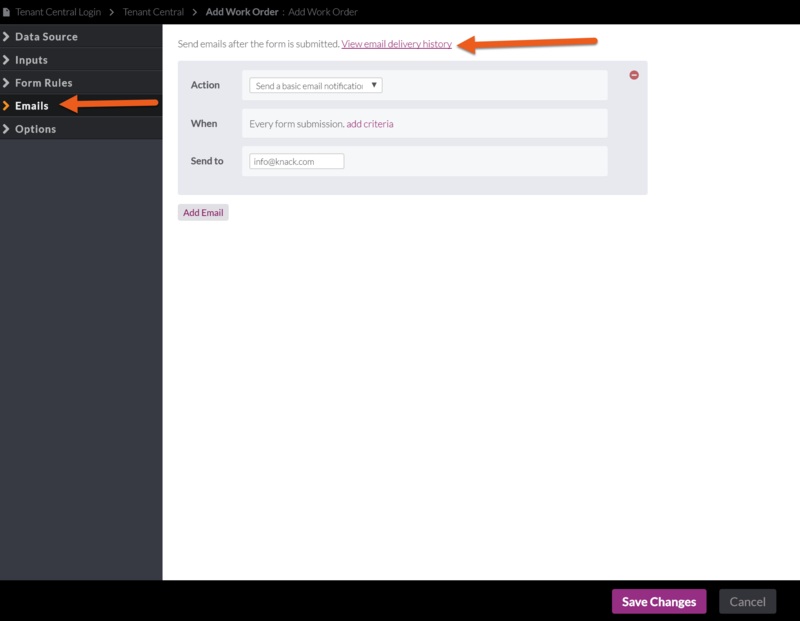 You can find the email history in the editor of the form view that contains the email rule. 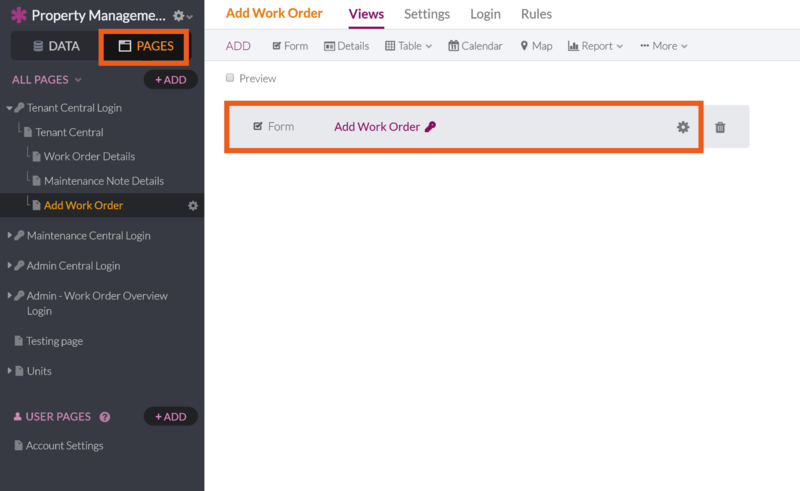 From the Pages section of the Builder, click on your form view to open the editor and click the "Emails" tab. You will find the link labeled "View email delivery history" at the top of the page. If you do not see the link, it means the view does not have any email rules; click here to learn how to add an email rule. 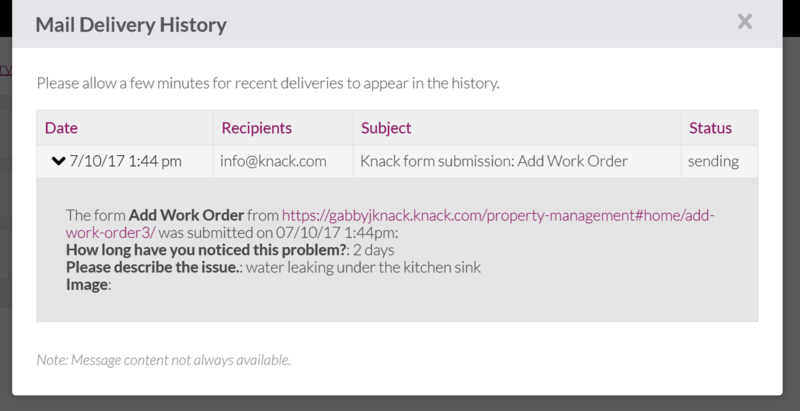 Click on "View email delivery history"
Knack Tip: Your email history still stores the history for any form email rule you may have previously deleted. You can find the email history of any scheduled tasks that send out emails from the "History" tab of the task editor. 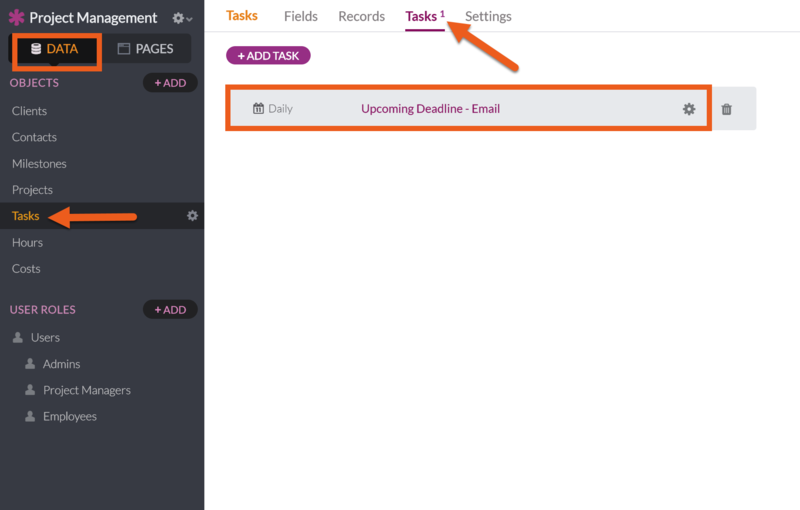 From the Data section of the Builder, click on the "Tasks" tab in an object menu and click on the task with the email rule. 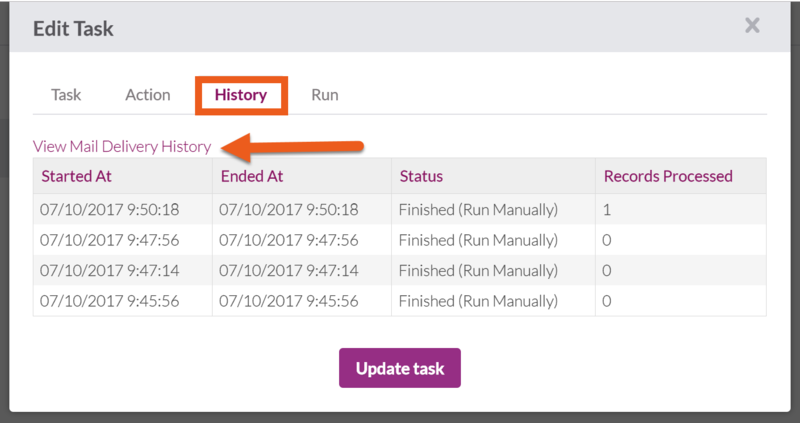 Go to the "History" tab - you'll see the history of task runs on this tab and when you click on "View Mail Delivery History" you'll see a list of the emails that were sent out. The date the email was sent. You can click on the expand icon to view the content of the message (if available). The list of recipients that were sent the email. All recipients (To, CC, BCC) are included in a single comma-separated line. The subject of the email. If you used field values, it will show you the full, rendered subject. Deferred The email cannot be immediately delivered, but it hasn't been completely rejected. We will continue to try delivering a deferred email for 72 hours. Delivered The email has been received by the recipient's server. This event does not guarantee that the email was placed in the recipient's inbox. It still needs to go through client SPAM filters, etc. Recipient address rejected, we may need to whitelabel your domain through our email whitelist request form. Bounced The server cannot or will not deliver a message, Bounces often are caused by outdated or incorrectly entered email addresses. Many times you won't know a bounced email address until it bounces. This event can help you ensure it doesn't bounce again by updating the email address in your Database. Spam The email has been reported as SPAM by the recipient or their email provider. Several SPAM reports may have your account's email privileges revoked; try to avoid sending the same email to these recipients. To see the contents of the email sent from the rule, click on the arrow next to the date/time. A gray box will show up below with the email body, fully rendered.